Our intrepid researcher, Steve Flora, has worked his way through the National Library’s excellent Trove service and come up with a selection of reports about meetings pro- and anti-conscription. Some newspapers were careful to report meetings on both sides. Others were clearly partisan. The reports run from 26 September to 26 October 1916. 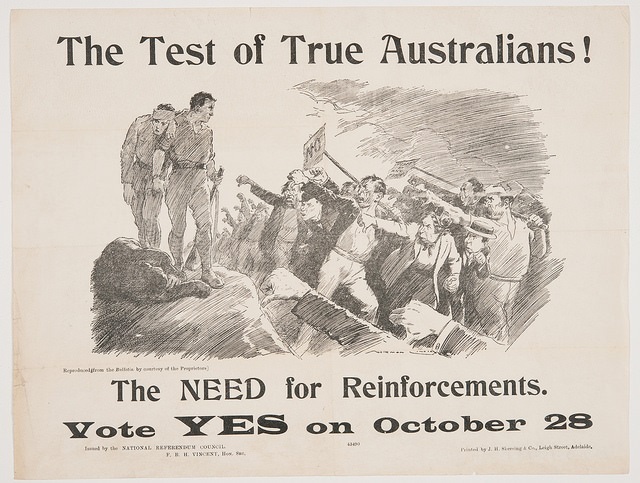 The first conscription referendum was held on 28 October. The Mayor of Geelong convened a public meeting in the Town Hall for 28 September ‘to form a strong National Referendum Committee to further the Government’s proposals’ while the South Barwon Council was to have a meeting on the same day for the same purpose. Up in Queensland in the Maryborough area, there were to be meetings in Pialba Shire ‘for the purpose of considering and deciding upon the best way of strengthening the hands of the Prime Minister in the prosecution of the war’ and at Tiaro where ‘ladies are especially requested to be present’. In Queensland also, there were reports of pro-conscription meetings at Hamilton, Rosewood, Ipswich, St George, Clifton and Gympie. At Rosewood, a person distributing anti-conscription material was described as a ‘traitor’. In South Australia, the Port Pirie Recorder and North Western Mail reported two anti-conscription meetings were to be held on 15 October at two locations in Port Pirie. Back down to Victoria in mid-October, where those attending the Mechanics Hall at Bungaree, near Ballarat, were to hear Colonel Bolton, Corporal Main and Private Tolliday speak in favour of conscription. The Wagga Daily Advertiser reported three pro-conscription meetings to one anti- as the battle came down to the last couple of weeks. The same week in Mount Morgan, Queensland, there was a well-attended meeting convened by the Central Queensland Conscription League. Hecklers were drowned out but the meeting was briefly disrupted by an argument between ‘a lady’ and an anti-conscriptionist. Mr. W. D. Armstrong, M.L.A., said it was not a matter of wanting or not wanting conscription, we must have it and he would do all in his power to help the cause. The man who voted “No” on the 28th would vote the very worst way. The best union to belong to was the British union in the trenches. One of the speakers was ‘Sergeant Bowie (a returned hero)’. That we loyal residents of Humpybong assembled pledge ourselves to stand true to the cause of our Empire and do our utmost to carry the referendum on October 28, and thus enable the Prime Minister to send the necessary reinforcements to our gallant boys at the Front. In Victoria, the President of Pyalong Shire, Councillor Greenshields, told a pro-conscription meeting that ‘after the Prime Minister had visited England and France, he saw for himself the immense sacrifices that had been made, and came back fully convinced that if we wanted to win the war, we must send more men’. At Sutton Forest in New South Wales, about 60 people heard a lengthy pro-conscription speech from the Mayor of Moss Vale, Mr Moon, after the chairman of the meeting, Mr Cunningham, began with the proposal ‘that Sutton Forest should tell the outside world that we are out to fight for our liberties’. 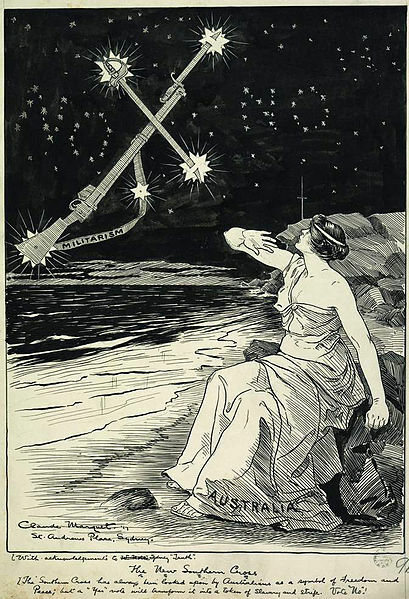 Mayor Moon said ‘if we vote no we would please the Kaiser, and thus prove that Australia could do no more’. Miss Froudinier from Sydney gave a rousing speech and spoke also to a separate meeting of women. She said she ‘would rather marry a black man than any coward’. In Portland, Victoria, the local paper advertised a ‘Grand United Conscription Rally’ to be addressed by a senator, a federal member and the local state member, the Hon. HJM Campbell, MLA. The last named was the great-grandfather of the compiler of this note. His son had died of wounds at Gallipoli in July 1915. 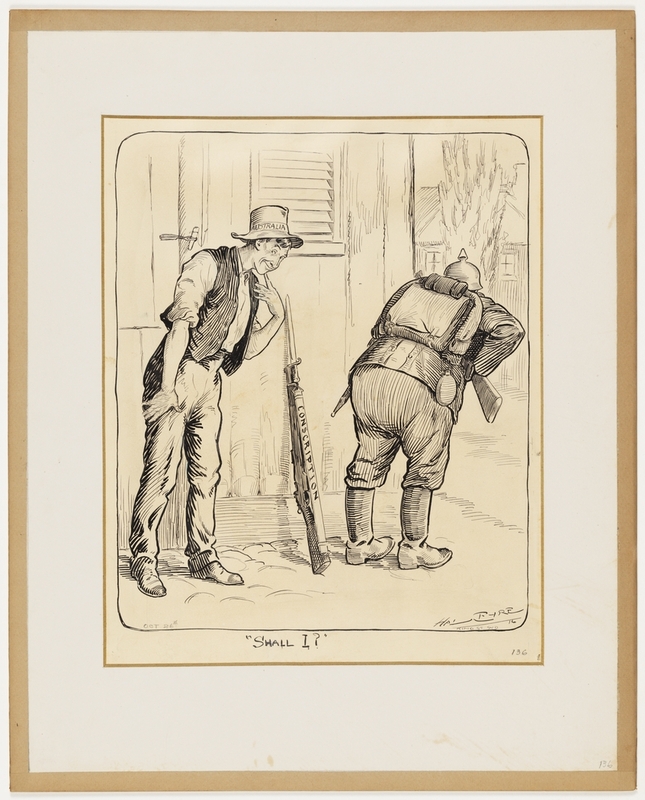 Further south-west in Tumut, a Mr Fraser told a meeting he deplored the ‘boo-hooing’ from the anti-conscription people and accused the antis of roughing up a returned soldier and ‘villainous abuse’ in general. Private Oliver, who had been roughed up, told the meeting that conscription was ‘the fairest and squarest way of winning the war’. He pointed out that Australia had had conscription for home defence for 14 years. The antis had ‘cold feet’. A Mr Sullivan said Mr Hughes was being punished by his party for doing the right thing. The Orange Daily Leader reported enthusiastic meetings both pro- and anti- on the same night, 17 October. The anti- meeting was described as the largest in Orange since the campaign began. Mrs Gray and Mr Asquith spoke against conscription at Cardiff near Newcastle on 19 October and there was another anti- gathering at Ourimbah. Anti-conscription meetings were held at Killarney and Crossley in the Warrnambool area on 20 and 22 October. Down at Bacchus Marsh in Victoria, the Mechanics Institute had pro- and anti- meetings on successive nights. The war had been forced on Great Britain [said the Hon. AR Robertson, MLA, on the pro-side]. Modern civilisation had been built up by the sea supremacy of Great Britain; and if that sea power was destroyed, where would Australia be to-day? Were they going to say they would not go out of Australia to fight? They must fight their enemies outside Australia, and that place now was France. It would come home to them if Australian people were violated as the Belgians had been. Seconding a motion, Mr Thos. Anderson said he hoped the vote on 28 October ‘would show very few pro-Germans in the district’. They were told when this war broke out they were engaged in a war of ideals; told that it was to succour the small nations, right against might, and civil law against Prussian militarism. The Prussian ideal was that no man should have a conscience, but be part of a great military machine. To-day the situation was changed, and they were asked to surrender the very ideals for which the very best blood of Australia had been poured out. If not voted out on the 28th the Prussian ideal had come to stay. In Sydney, there were pro- and anti- gatherings going on at the same time in the Domain on 22 October. The anti- side had six platforms and speakers from both federal and state parliaments and prominent trade unionists. In the past [at the Domain] the “anti” party had the field to themselves, but yesterday the other side took up a stand, and prominent supporters of Mr. Hughes and his party gave vent to their eloquence in such a manner as largely to detract from the gatherings of the no-conscription party. In Goulburn, there were pro- and anti- meetings on different street corners on the Friday before the vote. Miss Fourdrinier, who had featured earlier at Sutton Forest, was again on the pro- bill. On the anti- side Mrs Fay and Miss Loughran were ‘the lady speakers’. The Brisbane Courier reported meetings at Charters Towers and Toowoomba. State Treasurer EG Thedore was the main speaker at the latter, reported the paper, ‘devoting a considerable portion of his remarks to an abuse of Mr. Hughes’.